This year at the International Supercomputing Conference we detailed some of the major quantum computing development efforts, including updates from the Microsoft team on the Q# language, and the academic Project Q environment. We also learned more about how companies like Google are looking ahead to fault tolerant quantum systems as qubit counts scale up and, as we will highlight here, what is new with IBM on the quantum hardware and software fronts. Qiskit is an open-source framework for quantum computing whose goal is to be accessible to people with many backgrounds: quantum researchers, other scientists, teachers, developers, and general tech enthusiasts. The vision for Qiskit consists of four foundational elements: Terra (the code foundation, for composing quantum programs at the level of circuits and pulses), Aqua (for building algorithms and applications), Ignis (for addressing noise and errors), and Aer (for accelerating development via simulators, emulators and debuggers). Ignis and Aer are coming in the near future. At ISC, IBM quantum computing researcher, Paul Nation, provided an overview of the current offerings that are part of the IBM Quantum Experience, a cloud-based interface for working with quantum hardware (two 5 qubit devices, one 16 qubit system for the public, and the newest 20 qubit machines that are available to partners and member institutions). The Q effort is aimed at reaching the 50 qubit “quantum supremacy” milestone sometime in the next few years. 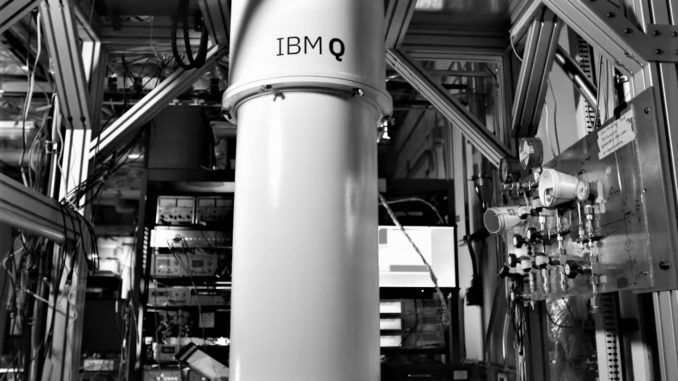 IBM’s experimental quantum journey began two years ago with an internal challenge to see if a team could build five qubit hardware that could be cloud accessible and reliable. Since then the software ecosystem for interfacing with IBM’s quantum hardware and simulator, called QISKit, has also evolved with more high-level interfaces for domain specific areas like AI and quantum chemistry with QISKit AQUA, a development platform that abstracts most of the manual circuit building that is necessary for quantum development with QISKit and (and other Python based quantum programming platforms like Project Q). The IBM Q software stack is open source and Python based. As Nation explains features include straightforward circuit composition, circuit rewriting through transformation, asynchronous execution and monitoring of jobs and complex visualization—something important to arriving at the final results. One of the most important features of the IBM platform, however, is the simulator, which is a critical piece for quantum developers as they move toward practical applications. A common question is why quantum developers rely on simulators when there is hardware available? It is actually useful to have both. With simulators, it is possible to model larger systems than are accessible and with unlimited circuit depth. This leads to faster prototyping since they are available immediately (unlike quantum hardware at times) and gives the ability to fine tune with more system information available and fine tune or verify results. On the topic of simulators, Nation shared a slide that has not been presented elsewhere of the IBM Q GPU simulator results. This is not available now but it shows the power of a simulation on the Power 9 architecture with GPUs. Here the team has plotted a quantum volume circuit (a tough problem for quantum systems given the lack of symmetries and scattered qubits). As the qubits scale and elapsed time grows it is clear where the various approaches max out. Non-expert Python users can take the simulator for a spin beginning here.